Fogartyville Cemetery - Located in Bradenton on 3rd Ave N.W. Manasota Memorial Park - Located in Bradenton on State Road 70. Palma Sola Cemetery - Located in Bradenton, adjacent to Palma Sola Community Church on 9th Ave. N.W. Mansion Memorial Park - Located in Ellenton on Ellenton-Gillette Road. Gillette Cemetery - Located in Palmetto, just outside of Ellenton on Ellenton-Gillette Road . Skyway Memorial Gardens - Located in Palmetto on Us Highway 19. Palms Memorial Park - Located in Sarasota on Honore Ave.
Sarasota Memorial Park - Located in Sarasota on South Tamiami Trail. Bethany Cemetery - Located in Myakka City, adjacent to Bethany Baptist Church on State Road 64 E .
National Cemeteries are owned and operated by the United States Veteran's Administration. 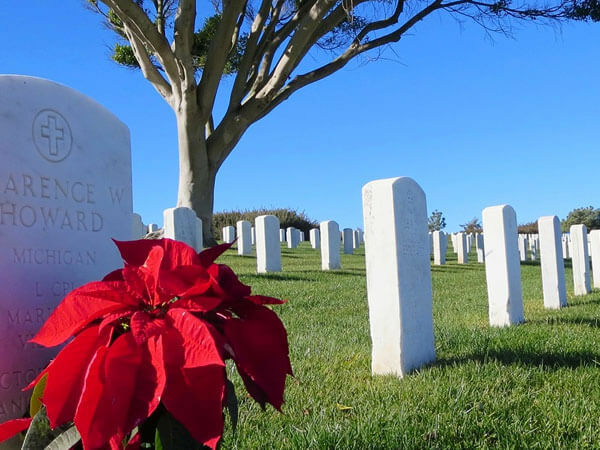 These cemeteries are only open to US military veterans and their spouses. All burial, entombment, inurnment and memorialization costs are covered by the Veterans' Administration. Sarasota National Cemetery - Located in Sarasota on State Road 72, also know as Clark Road. Florida National Cemetery - Located in Bushnell on S.W. 102nd Ave.
Bay Pines National Cemetery - Located in St. Petersburg on Bay Pines Blvd. *Only open to cremated remains.